Congratulations on taking a significant step toward an intentional life in Christ. As promised the Intentional ONE THING Challenge is chock full of free resources to help you develop an intentional life. We encourage you to take full advantage of everything that we have to offer. The videos, eBooks, and other tools that we’ve provided are jam-packed with rich content that are intended for you to go through over the course of a few weeks so don’t rush through it. IMPORTANT: Bookmark this page so you can revisit the Intentional ONE THING Challenge resources as often as you would like. CREATE A CLEAR PICTURE. In this lesson you will learn how to develop a ONE THING goal. DEVELOPING NEW HABITS. Learn all about developing new and healthy habits to help you reach your Intentional ONE THING goal. OVERCOMING ROADBLOCKS. Find out how to knock down those things that keep you from living an intentional life. FINISH STRONG. Discover what it takes to finish a lifetime strong for Christ, for yourself, and for your loved ones. FREE DOWNLOADABLE eBOOK. Designed to equip and challenge you to live life with more purpose and more meaning today, and more hope and success tomorrow. DOWNLOADABLE ASSESSMENT. A free self-discovery tool that will help you learn a little bit more about yourself by helping identify if you are more of a head (thinker) person, a heart (emotional) person or a doer (action oriented). FREE eBOOK. 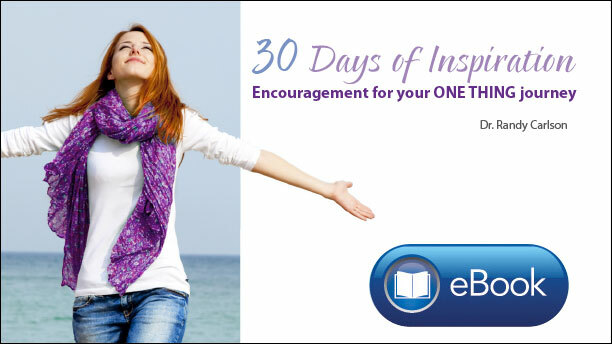 Read one entry each day to inspire you in completing your 30 day challenge.